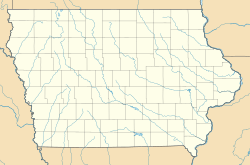 The Fish Creek Bridge is a historic structure that was originally located east of Salem, Iowa, United States. The span carried Hickory Road over Fish Creek for 50 feet (15 m). It is a small-scale, wrought-iron bridge that the Henry County Board of Supervisors bought from the George E. King Bridge Company of Des Moines in 1893 for $410.80. It was believed to have been fabricated by their parent company, King Iron Bridge Company of Cleveland, and assembled by local laborers. Its historical significance derived from its being an uncommon variant of the Pratt truss. It was listed on the National Register of Historic Places in 1998. Subsequently, the bridge has been replaced at its original location, and the historic structure was moved to Oakland Mills Park. ^ "Fish Creek bridge". Iowa Department of Transportation. Retrieved 2017-02-20. This article about a bridge in Iowa is a stub. You can help Wikipedia by expanding it.